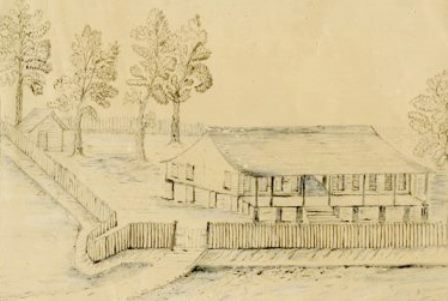 The log cabin Capitol stood at the present-day corner of Colorado and 8th Streets. Image Courtesy Texas State Library and Archives Commission, 0001/103-33. 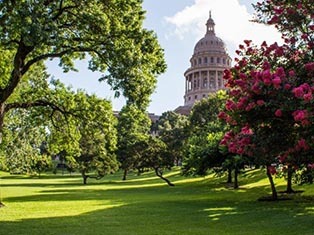 The Republic of Texas established Austin as the capital. A log cabin with two large rooms and smaller meeting rooms served as the Capitol. An eight-foot stockade fence surrounded the structure for protection during Indian raids. 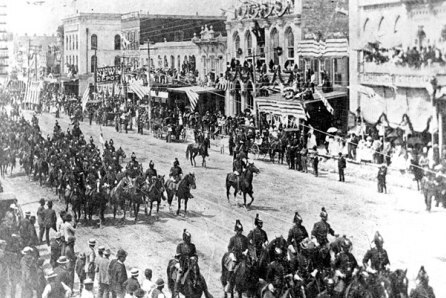 Limestone Capitol during the funeral of Governor Andrew Jackson Hamilton on April 12, 1875. Image Courtesy Austin History Center, Austin Public Library, Chalberg Collection of Prints and Negatives, C00253. 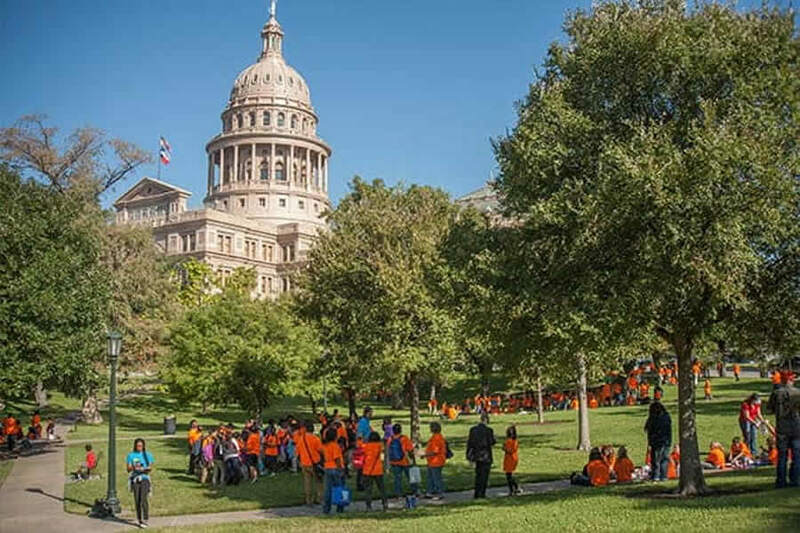 Texas constructed a limestone Capitol located at Capitol Square (near the present-day Confederate Soldiers Monument on the Great Walk). The building lacked architectural refinement and one publication called it an "architectural monstrosity." XIT cowboys resting at the chuckwagon. The Constitution of 1876 authorized the use of 3 million acres of public land in the Texas Panhandle to pay for a new Capitol. 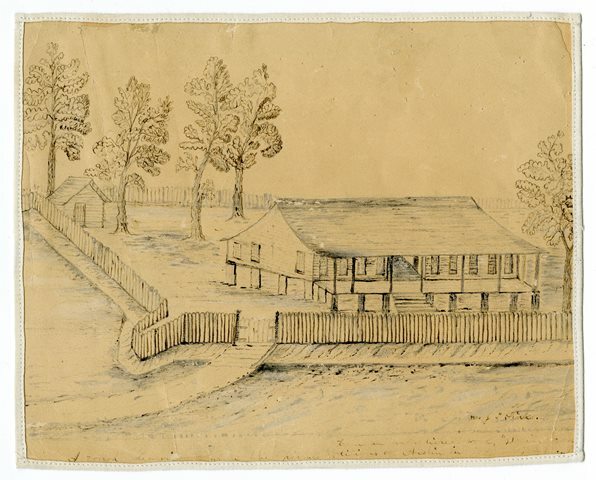 The Capitol Syndicate including John and Charles Farwell from Chicago paid for the construction of the present-day Capitol in exchange for the land, which became the famous XIT ranch. 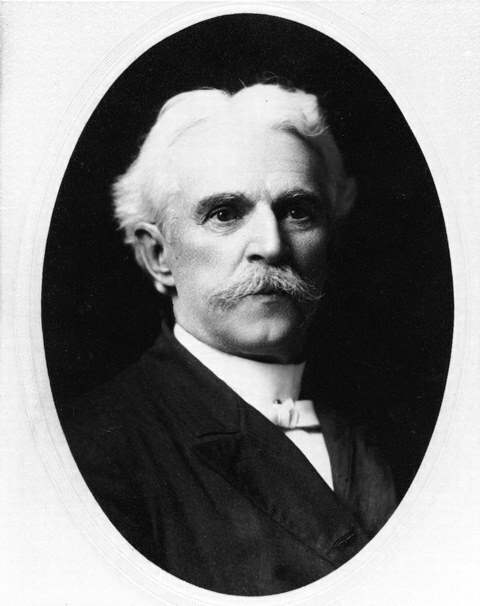 Architect Elijah E. Myers also designed the Michigan and Colorado state capitols. Image Courtesy Detroit Public Library. 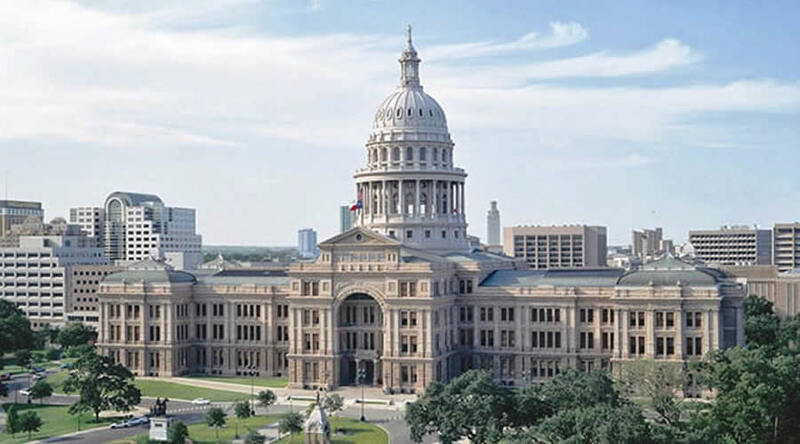 Texas officials announced a nation-wide design competition for the new Capitol with an award of $1,700. Eight architects submitted eleven designs. 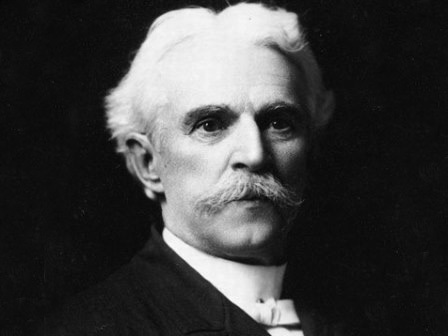 Texas officials approved the design of Detroit architect Elijah E. Myers. The Capitol burning on November 9, 1881. Image Courtesy Austin History Center, Austin Public Library, Chalberg Collection of Prints and Negatives, C00231. 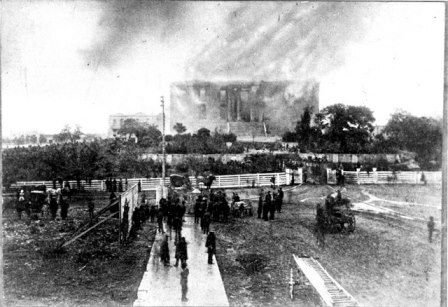 The limestone Capitol caught fire on November 9, 1881. The Capitol Board had been meeting in the building when the fire broke out and the plans for the new Capitol barely escaped the flames. 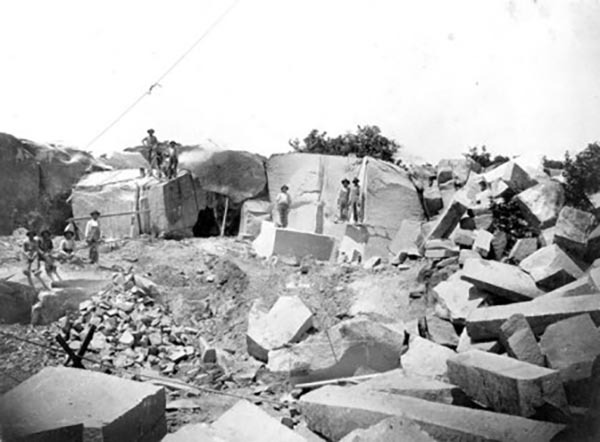 Workers cutting the enormous blocks of granite, c. 1885. Image Courtesy Texas State Library and Archives Commission, 1975/050-5. Contractors began using limestone from south Austin for the foundation. They discovered it began to discolor when exposed to the atmosphere. 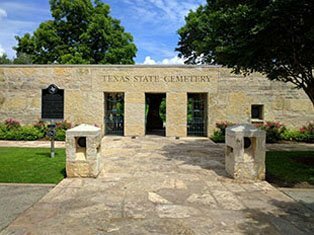 The owners of Granite Mountain in nearby Burnet County donated all the Texas Sunset Red Granite required. Workers shipped 188,518 cubic feet of granite from the quarry on a specially constructed railroad. Image Courtesy Austin History Center, Austin Public Library, PICA 18595. 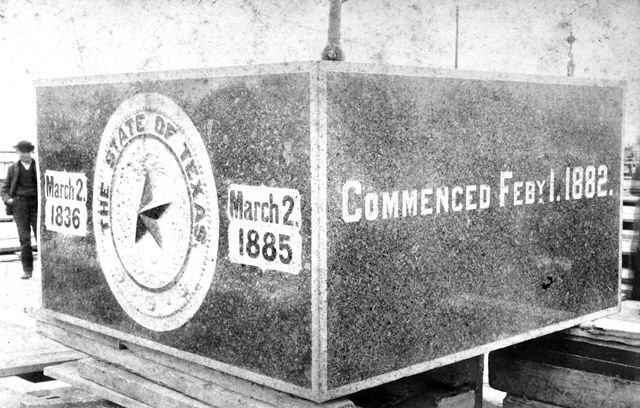 Texans laid the cornerstone on March 2, 1885. Numerous government and civic dignitaries attended the ceremony. The 12,000-pound stone had a niche carved into it to hold a zinc box, which held collected mementoes. 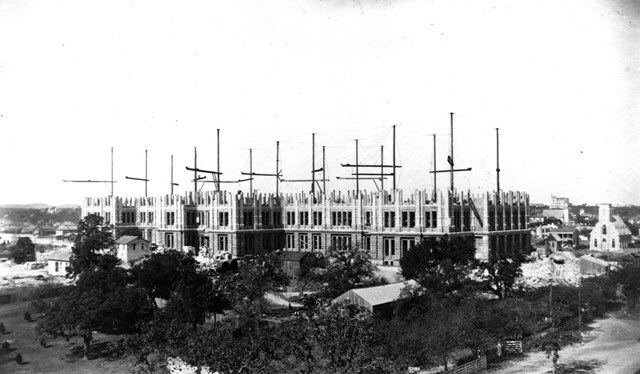 Construction of the Capitol's third floor, c. 1887. 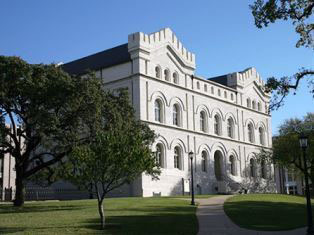 Image Courtesy Texas State Library and Archives Commission, 1965/089-13. Ten derricks hoisted the massive stones from the railcars to any part of the outside walls. 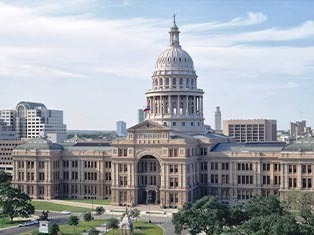 It took over 1,000 people to build the Capitol and when completed the building had 392 rooms, 924 windows and 404 doors. The support structure of the dome, c. 1887. 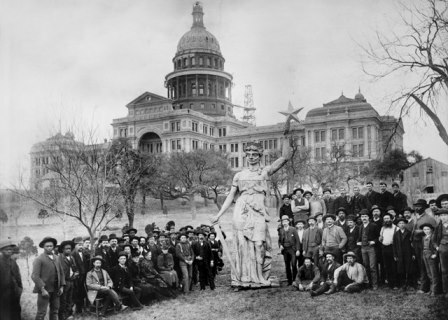 Image Courtesy Austin History Center, Austin Public Library, PICA 27293. 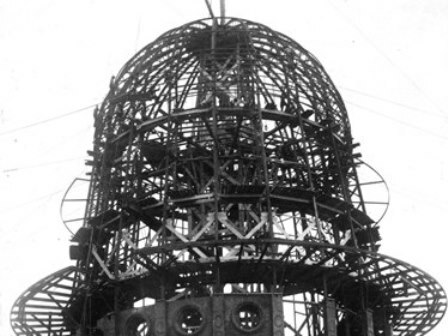 The dome featured a system of iron braces along with a wrought-iron framework imported from Belgium. They painted the external metal panels to match the Capitol's granite. The Goddess of Liberty just before crews hoisted her to the top of the Capitol, February 1888. 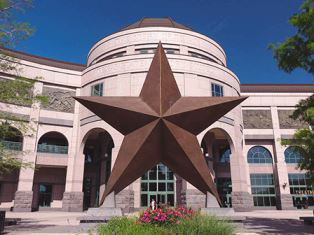 Image Courtesy Texas State Library and Archives Commission, 1989/090-1. Metal contractors created the Goddess of Liberty by welding 80 pieces of zinc into the four major sections: the torso, the two arms and the head. 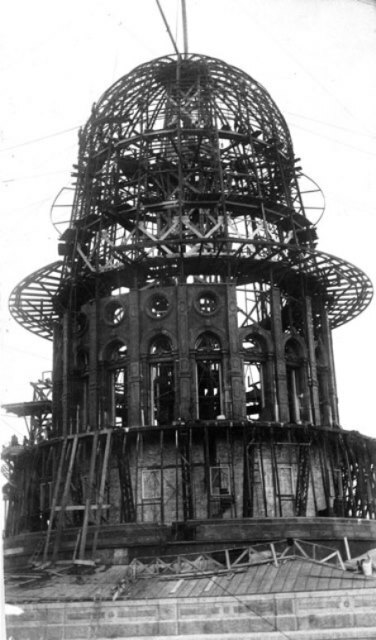 A crew hoisted each section to the top of the dome and used large screws to hold her together. 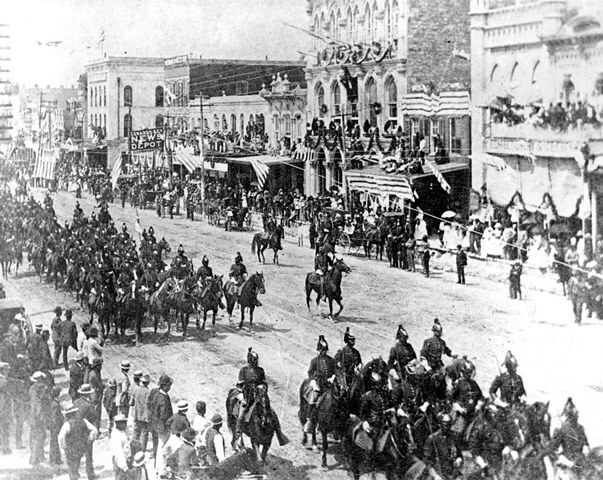 Drill teams participating in the military procession to honor of the new Capitol, May 1888. Image Courtesy Texas State Library and Archives Commission, 1932/005-79. Over 20,000 people attended the week of festivities to dedicate the new Capitol. The celebration included drill team competitions, military displays, band concerts and fireworks. 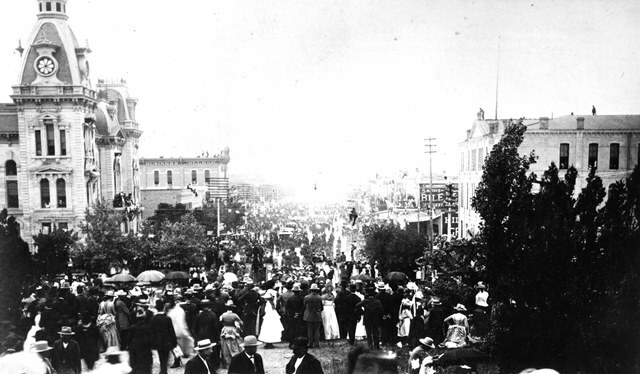 The city added special streetcar lines to bring the large crowds from an encampment a mile outside of town. Crowds preparing for the dedication ceremony on the Capitol Grounds, May 16, 1888. Image Courtesy Austin History Center, Austin Public Library, Frank Caldwell Papers, AR.X.016 H(010). 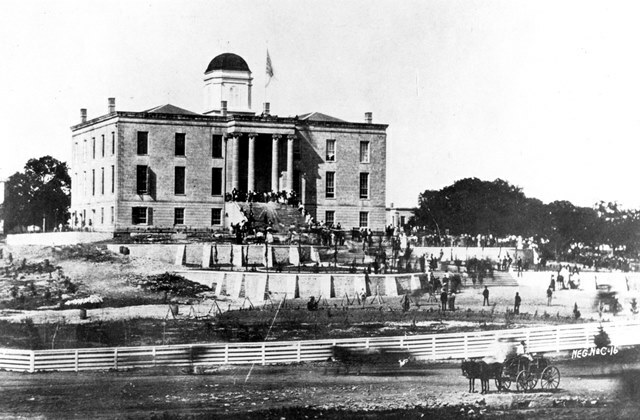 Crowds lined Congress Avenue and filled the Capitol Grounds to view the official dedication of the Capitol. 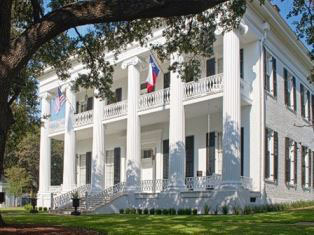 Senator Temple Houston, the youngest son of Sam Houston, accepted the building on behalf of the state. He expressed the pride Texans felt in the building. 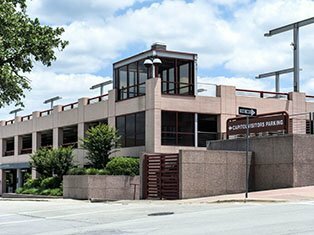 "This building fires the heart and excites reflections in the minds of all... the architecture of a civilization is its most enduring feature, and by this structure shall Texas transmit herself to posterity."